The Urbanism Department is responsible for planning, land management and environmental protection. It is responsible for the issuance of permits and certificates required by citizens. The Urban Planning Department is also responsible for the enforcement and administration of certain by-laws. If you plan to undertake work on your property any time soon, we suggest you contact the urbanism department to find out if a permit is required. Please note that the phone number on the forms is no longer valid. Obtaining a certificate of authorization is not required for the purposes of normal maintenance of a construction provided the foundations, framing and exterior partitions and/or interior are not modified and the floor area is not increased. This applies to small jobs done separately and not for a set of small jobs. Small jobs are subject to all general dispositions or particular provisions. replacement or modification of the floor covering. The emptying of septic tanks is mandatory for all residences of Arundel, as no sewer service is present. Every 4 years for a secondary home occupied a maximum of 180 days per year. It is mandatory to submit to the municipality a copy of the invoice proving the septic tank has been emptied as soon as it has been done. Shoreline protection: I see to it! The water quality of our lakes and rivers is an issue that concerns us all. To meet the challenge generated by this issue, the municipality wants to follow suit and enforce its by-laws, just as the neighboring municipalities have done in recent years. A riparian zone is an indispensable element to ensure a healthy transition between terrestrial and aquatic ecosystems. Indeed, the shores of lakes and rivers represent screens facing premature warming waters and essential barriers that stop the excessive inflow of sediment. In addition, riparian protection strips play a key role against soil erosion and represent regulators of the water cycle, besides being one of the main filters against water pollution. How to identify a riparian zone? A shoreline can play its role to the maximum only under certain conditions. First, it is necessary to identify the high water line. This line is located generally where there is a change between a predominance of aquatic plants to a predominance of terrestrial plants. It is also possible to identify it in the spring when the snow melts, when the water reaches its highest level. If the bank has a slope of less than 30%, the shoreline must have a minimum depth of 10 meters from the high water line. However, if the bank has a slope greater than 30% and more than 5 meters high, the protective strip is 15 meters from the high water line. In the riparian zone, no work on the control of vegetation is allowed (no lawn mowing or collecting dead leaves). However, when the slope is less than 30%, an opening or openings with a maximum combined width of 5 meters are permitted but must necessarily be covered with a ground cover plant. When the slope of the shore is greater than 30%, pruning and cutting down of trees are allowed to make a hole with a maximum width of 5 meters in vegetation. In addition, a winding path with a maximum width of 1.2 meters can be achieved without filling or clearing. If stairs are required in this path, they must be built on stilts. At all times, the path should be covered with a ground cover plant, also under the stairs. It is also possible to control vegetation on a maximum width of 2 meters along the perimeter of buildings and structures that are found in the riparian zone. For regulations concerning the protection of banks, see Chapter 10 of zoning by-law #112 (link above). 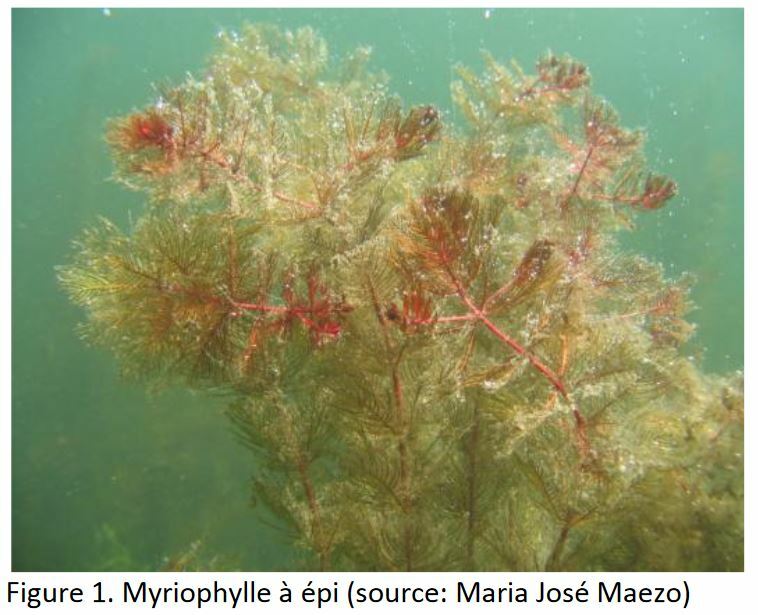 Eurasian water-milfoil can grow up to a height of 10 meters, but usually reach between 1 and 4 meters. The plant is rooted to the bottom of the lake and expands to the surface, where it branches abundantly, creating a dense mass. 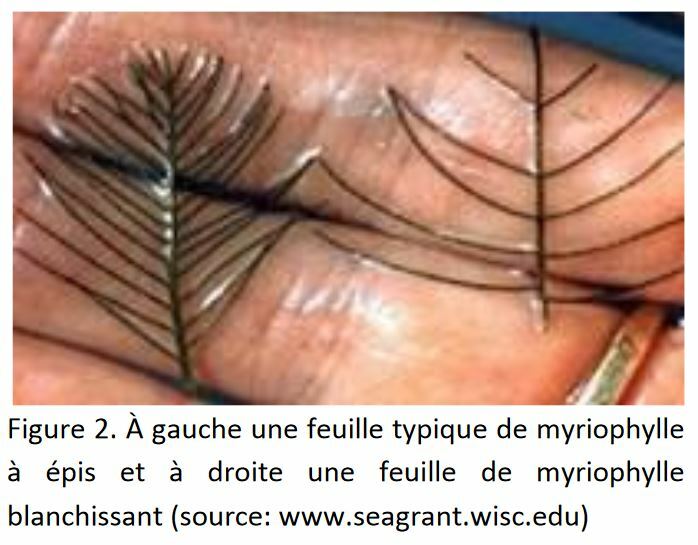 The Eurasian water-milfoil reproduces mainly by vegetative fragmentation (cuttings). Thus, small rod fragments detached from the mother plant can take root and colonize a region. Each rod can easily produce twenty new plants. Therefore, motorboats represent a particular danger of contamination, since their propellers cut the plant into fragments, thereby allowing the release of hundreds of new plants nearby. 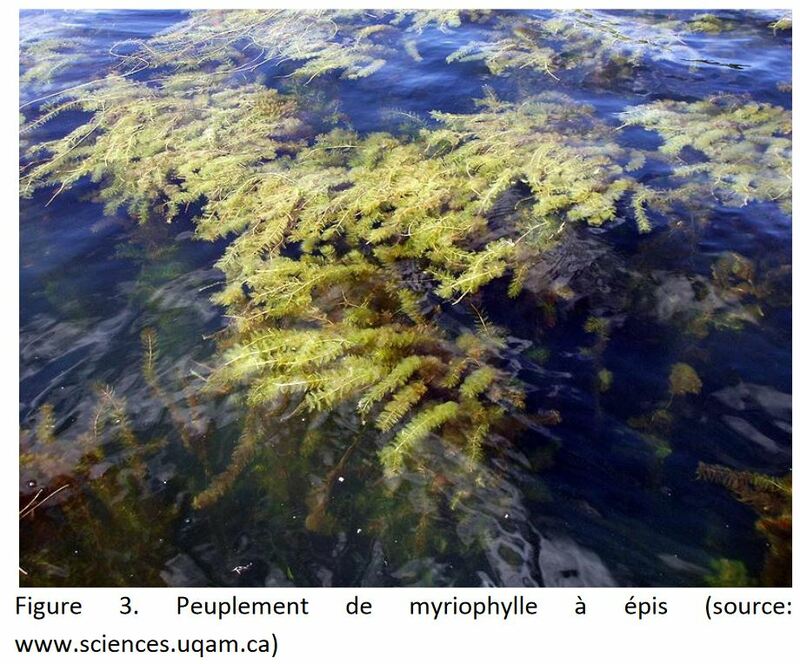 The stands of Eurasian water-milfoil reach such density that they tend to dislodge any other plant species. In addition, the natural chemical balance of the lake is disturbed, which may cause the disappearance of the natural wildlife habitat. If we all make an effort to implement the recommended preventive measures, we will succeed in slowing the proliferation of Eurasian water-milfoil and protect the quality of the lake.